The incident occurred at the Oliver Bond Flats. THE TEENAGER WHO fatally stabbed 21-year-old Lorcan O’Reilly in the heart at a Halloween bonfire party was sentenced today to four-and-half-years’ detention. 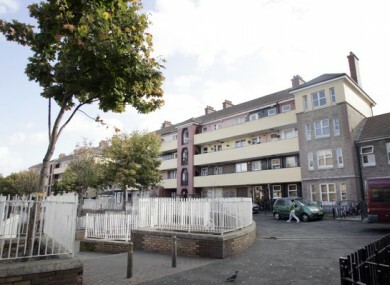 At an arraignment hearing at the Central Criminal Court last November, the boy, who was 14 at the time, pleaded not guilty to murder but guilty to Lorcan O’Reilly’s manslaughter at the Oliver Bond flats in Dublin during the early hours of 1 November 2015. At today’s sentencing hearing, Mr Justice Patrick McCarthy told the court – which had been closed off to members of the public except close relatives of the accused and deceased – that the accused was guilty of “a very grave offence”. Approximately 23 people were congregated in the area, and during the course of the evening an altercation occurred between the deceased and the accused. During the row, the judge said, the accused had been brandishing a hurley but left the scene after it was taken from him by O’Reilly. The boy, who is now aged 16 and cannot be named due to his age, returned a short time later with a knife in his possession and struck Lorcan O’Reilly in the chest with the weapon. Mr Justice McCarthy added that the offence of manslaughter is “rendered far more serious when a knife is introduced into the equation and this is what the accused did”. Referring to a “deeply affecting” victim impact report from O’Reilly’s father, Paddy Rooney, which he read out in court last week, the judge said one sentence in particular had summed up the family’s loss. And I quote, ‘When he was stabbed in the heart that night it was all our hearts that were broken”. The judge added that Lorcan O’Reilly’s “parents and other members of his family are having great difficulty getting over the death”. He said that the appropriate sentence for this offence would have been eight years. But, due to the accused’s early guilty plea, he was reducing the term by two years and would suspend the last 18 months of the sentence imposed. The judge also noted the accused’s upbringing, which he described as “unsettled”. He said the members of the household that the accused had grown up in were fear of “third parties” and that “there were frequent visits to the house by members of An Garda Siochana”. The judge said that background reports had revealed that the accused had a low IQ. He said that the accused admitted to a psychologist to having a “short fuse” and a “tendency to lose his temper” but he had “also expressed regret and he has some understanding of the harm he has caused”. Mr Justice McCarthy said the suspended part of the sentence would last for two years, during which time the accused must be of good behaviour, abstain from taking illegal substances, and not associate with such persons deemed as inappropriate by the probation service, “save members of his immediate family”. Email “Teen jailed for 4.5 years for stabbing young man in the heart at Halloween party”. Feedback on “Teen jailed for 4.5 years for stabbing young man in the heart at Halloween party”.